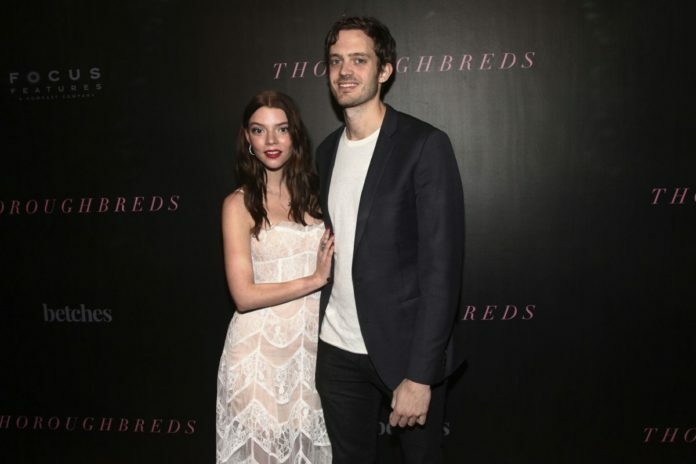 Anya Taylor‑Joy, left, and Cory Finley, right, attend a special screening of Focus Features' "Thoroughbreds" at the Roxy Hotel on Tuesday, March 6, 2018, in New York. Since I saw “Thoroughbreds,” I have often rambled through the Connecticut mini-manse occupied by Lily, played by Anya Taylor-Joy, in my mind: so much polished marble on the walls, floors, counters. Very cold and spotlessly sterile, it is understandable how Lily, her mom Karen (Kaili Vernon), and stepdad Mark (Paul Sparks) could live totally separate lives in different wings or floors, and yet never have privacy due to the incessant echoes bouncing off the rounded corridors or winding down the steps, exacerbating the slightest clack of a heeled shoe, not to mention the reverberations of an upstairs exercise machine. It is a pressure cooker of controlled isolation, dangling the teenager’s sense of identity and expression in front of her before snatching it away. Lily plays the good girl, adept at convincing parents that she can turn their wayward children, including former and now troubled friend Amanda (Olivia Cooke), toward the light. Amanda assumes the role of bad girl, as it at least gives her a tenuous freedom to occupy and explore other people’s interiors while they stare at her, either dumbfounded or wary. Both girls have storms steadily approaching, though neither is quite sure of the impact on each other’s lives; for the moment, they live in the moment, balancing an existential analysis of what it means to feel with a deliberate submersion into either sensory overload or denial. Whatever path each girl chooses, it inevitably intersects. Writer and director Cory Finley originally thought his “Thoroughbreds” script would translate to stage instead of screen, and as his story unfolds in four parts, we see the different relationship each girl has with physical space: while Lily is often dominated by her interiors (thanks to the gorgeous cinematography of Lyle Vincent which flaunts light and shadow), Amanda takes full advantage of her occupancy of each room. She knows how to assume control over space while Lily is made vulnerable, and as the old friends grow closer again, they learn from each other how to hide both externally and internally. Thanks to composer Erik Friedlander’s sumptuous, percussion-and-cello score that either tumbles through the slick interior walls like fog or crackles through the air like static on a cold day, the gradual symbiosis of the girls toward mutual gain emanates from its catalyst: Lily’s oppressive, vain, brutish stepfather, Mark. Mark becomes the cynosure of everything they are denied and want, and soon they devise a plan to dismantle the world he dominates and construct their own reality. Lily, who feels everything, learns to compartmentalize her reactions, while Amanda, who feels nothing, hones her mimicry of emotional expressions. In one of his last performances (he died tragically in 2016 in a highly-publicized vehicle accident), Anton Yelchin is Tim, a local drug pusher and self-described “entrepreneur” who the girls entice, and later blackmail, into killing Mark. He also desperately wants to sustain the persona he has cultivated, and the girls capitalize on his gullibility and ego by promising to solidify that image. Naturally, he is overwhelmed and terrified by their tenacity. It is through Tim’s shaky bravura, however, that the cracks in the girls’ characters peek through, from Amanda’s Robin-Tunney-in-Empire-Records malaise to Lily’s lack of accountability over a cheating incident at school. It doesn’t prevent our engagement in the story but it does widen the disconnect between the characters and our sympathies as the posing turns self-referential. The murder scenario occupies the more volatile latter half of the film which alternates between increasingly dark humor and a deranged calm that is insulated by the polished marble and wood of the Connecticut house. “The only thing worse than being incompetent or being unkind or being evil is being indecisive,” Amanda says, and as she reveals the truth behind the dark rumors about her recent past, we see the bud of her emotional immobility. According to her rationale, murdering Mark won’t elicit her feelings but will allow Lily to move forward just as her stepfather was threatening to set her back educationally and socially. A champion horserider, Amanda is ruthlessly efficient in her game plan and confident in her concept of right and wrong, while Lily’s initial hesitance shatters under the pressure of her luxurious confines. Finley capitalizes on this ebb and flow of persistence and setback as Lily’s house takes on a naturalistic order in itself, making the those in power increasingly vulnerable and the small seem very big and very dangerous as they memorize the hard surfaces and sharp corners. In the end, we are left wondering who is the better imitator.